The Isle of Man is a separate country set in the middle of the Irish Sea with its own government, laws and a lot less income tax! It is still governed by the Kennel Club and there are just two KC registered clubs on the Island that offer agility training: Ramsey DTC where I’m chairman, show secretary and trainer… and the Isle of Man DOC. Since those of us ‘down north’ (Ramsey!) 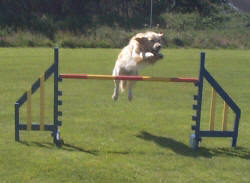 added agility to our training agenda some years ago, we have been really pleased with the interest in the sport. Our training takes place weekly on a Friday evening in an indoor riding school so we are fortunate to have year round cover, especially appreciated when we get to those long wet Manx winters. However, this can prove a disadvantage when it comes to one's first competition in the great outdoors but, as with all dog-based activities nationwide, there is not exactly a wealth of facilities on offer to us so it must be treasured! 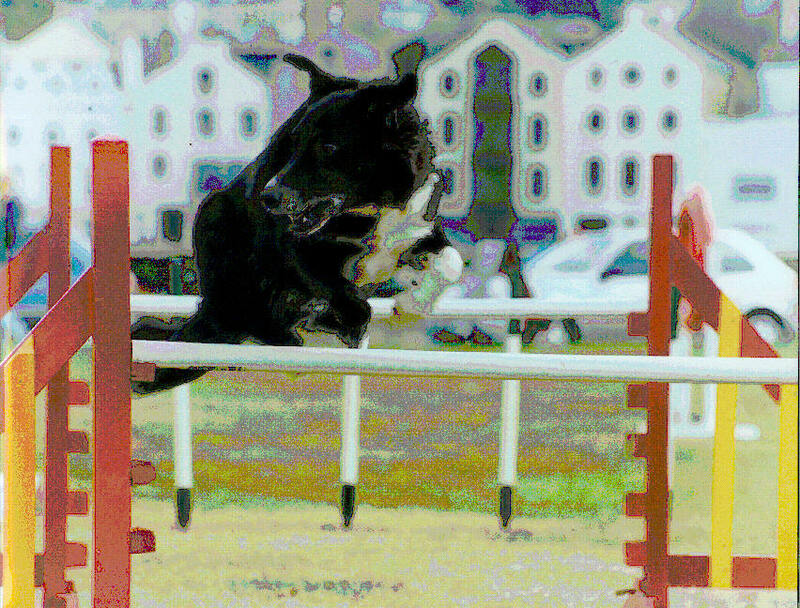 Until we added our own weekend Open show to the agility calendar five years ago, many Manx handlers found they did not have sufficient competition to interest them in becoming solely involved in one discipline. Competition prior to this consisted of a one-ring weekend show per year and a couple of displays at agricultural shows and similar, so it was not unusual to find dogs also competing in Obedience or the show ring. But this trend is noticeably changing now with the two weekend open shows and a general increase in interest and awareness of the sport. Many also now compete regularly in the UK and although it can be hard to keep up with current course trends and maintain that competitive edge, they shouldn’t be considered country yokels – we can still give you a run for your money! Undoubtedly the main handicap for all Manx competitors is the geographical limitations of living on an Island. It costs considerable time and money to get off the rock to UK shows. I have no doubt that the invention of a gizmo that just beams us through (Scottie!) would prove immensely popular! Both clubs draw on the expertise and experience of UK trainers to keep handlers and dogs on their toes with regular weekend training sessions throughout the year. We have been very fortunate to have Kay and Robin Cope, who judged at our show last year, on hand to guide and advise us. Their interest has been very much appreciated by all the members who have benefited from their help. Each club also hosts an annual inter-club match to give everyone a little more competition, but familiarity with all the dogs and handlers participating can prove a disadvantage and does incline to detract from the competition as I suppose is inevitable with the same people and dogs every time. You know each of their weaknesses and strong points and there is a feeling of predictability. There is nothing like the unknown to prompt that adrenalin rush and inspire you to pull out all the stops to meet the challenge head on and that has certainly proved to be the case whenever our handlers have travelled across that stretch of water to compete! We have just started a new beginners course with about 20 keen handlers from all over the Island, several of whom are completely new to the sport and some agility addicts starting with a second dog. We have also had to review our plans for Ramsey DTC’s 2004 show as many of you will already have read from the Club announcements. 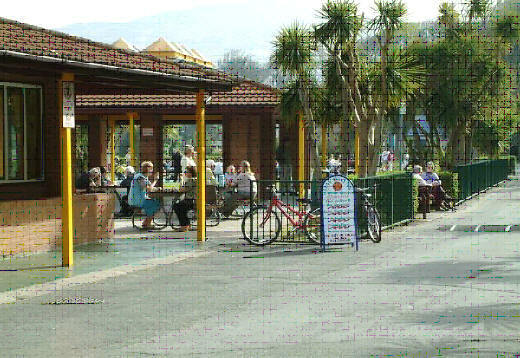 That came as a particular blow after the tremendous success of this year’s show - not to mention fabulous weather! - but we are determined not to be beaten and have hopefully come up with the answer by moving to an entirely independent weekend next year. It is regrettable that we will not now tie in with the IOM DOC show but their move rendered that impossible for us. However, we are confident that the combination of an excellent venue and relaxed atmosphere whilst maintaining the smooth efficiency you would expect of a UK show, it will continue to prove as popular as it has to date. So if you fancy some agility Island style, it might not be quite so exotic as you first thought but with some serious walking on hand in beautiful countryside as well it could prove to be a holiday with your dog to remember! Debbie Martin's first dog, other than family pets, was a six months old rescue collie cross who in time became her first agility dog. When her family moved from the south of England to the Isle of Man just over 15 years ago naturally Kizzy came too. No sooner had they moved into their new bungalow than they decided it would be really nice for to have a pal! But, as with all best laid plans, what we had hoped would be ‘two’s company’ turned rapidly into ‘double trouble’! There was no doubt that training was needed and the rest, as they say, is history! Having found the help she needed was somewhat lacking at that time at our local dog club (the same one she is now Chairman of!) she was fortunate enough to find one to one help and so it all began! First of all it was Obedience, but Kizzy found this totally uninspiring, having always preferred a more adventurous sort of life. She had always loved to walk on walls, climb trees (Yes, I did say climb them!) and generally get up to the kind of gymnastics that at that time seemed not quite normal for the average canine! Dog number two, another rescue of large and indeterminate parentage but with a large dollop of Labrador, was never destined to do agility as he could barely cope with four legs on the flat never mind anything more athletic! So Hobo continued my interest in Obedience while Kizzy made a natural transition to agility, and frankly we never looked back. Debbie won out of Starters fairly early on with a friend’s dog A word of advice - never run a dog for a friend no matter how close she is to giving birth! 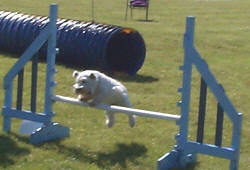 Kizzy was undeterred and went on to win her first Novice Agility at nine years old. Sadly Debbie was to lose her later that same year to cancer, a shock it took some time to get over. But before this, however, she had decided that it was time for a new pup but it was definitely NOT going to be one of those black and white wind up affairs. They were complete lunatics! So along came Luke, working sheepdog... oops! Just like her others, he was a ‘meant to be’ dog - and she now confesses that she is now hooked and wouldn’t contemplate anything else! In 2000 Luke qualified to Senior competition in just one week – winning Novice Agility one weekend and Open Agility the following weekend – and at just four years old! It was a fantastic achievement of which she is still very proud as he is the first Manx dog to qualify to this level of competition and so far remains the only one to do so. To be honest, she says that it is not been easy to continue to compete at this level as they just don’t get the experience but he has managed a number of places in intermediate in the UK. Debbie's goal is still that elusive clear Senior round and they came oh so close at Wyre AC show in June this year, blasting a lovely flowing course (Thank you judge, that was sheer bliss!) but just knocking that dratted last pole! Having now lost both Hobo as well as Kizzy, Debbie has continued to add to her canine family in the form of Heidi, a small Corgi X Jack Russell, now almost 14 years old with legs that would be better suited to an antique sideboard; Josh, another working sheepdog and again a rescue who came with some serious health and behaviour problems, now 2.5 years old; and finally Bea (known to all as Baby Bea) at just seven months who is her first 100% border collie with the paperwork to prove it! So as you can see she's hooked but she knows there are many out there with far more – honest, there are! 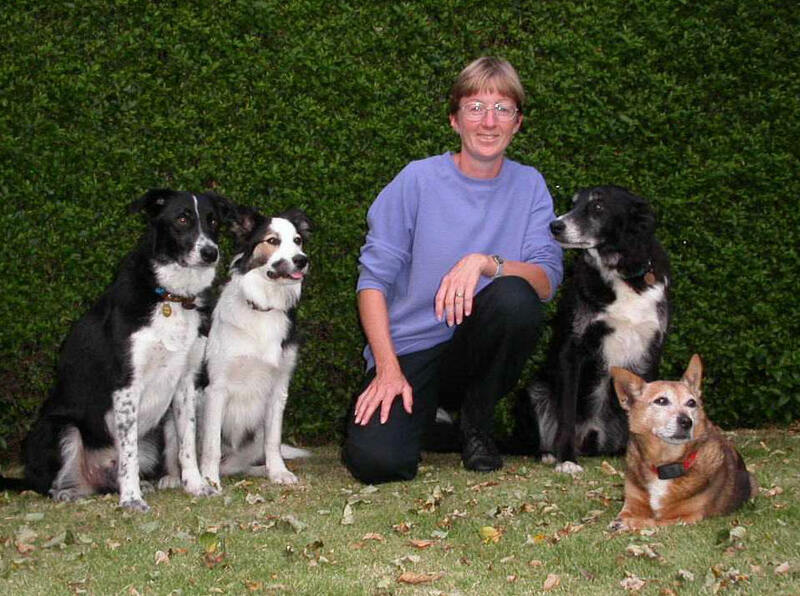 Debbie joined the Ramsey Dog Training Club more years ago than she cares to count – somewhere over ten and soon became actively involved as a trainer, at that time with pet dogs and obedience. She began teaching agility privately with a few friends and eventually managed to convince the Club’s committee to take the sport on board and here we are! She became Chairman some years ago and volunteered to take on the job of Show Secretary for our very first Open Agility show five years ago. She confesses, though, to a change of direction now from Agility back to Obedience, thanks to a great trainer who has put the fun back into Obedience for me! Luke has also won out of Novice in Obedience last year (did that in one weekend too!) and is successfully working classes A and B, Josh is knocking at the door of his novice and Baby Bea is proving to be an absolute dream but will that change? 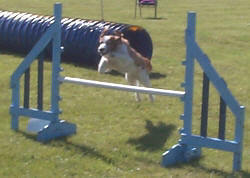 Under your article Agility Island Style did you see the picture of the Mini dog jumping? That is my Westie called Mabel, and we won’t mention her ears! We believe that her mum was forced to watch Dumbo several times whilst pregnant. She has the most lovely temperament, especially for a terrier. Even as a puppy she was quiet and gentle but is totally focussed where agility is concerned. She refuses to lark around with the other dogs at club night but sits waiting very calmly for her turn. This weekend at the Southern Agricultural Show she got a second, third and fifth, and that is overall with no time allowances for her little legs, her lack of higher placing shows my lack of experience. She showed the collies what it was all about! A proper dog in the agility ring for a change! As I type this she is underneath my desk fast asleep quite oblivious to her moment of fame, but watch out Mabel -- Tobias, my rescue Westie, is having his first lessons and is a star in the making!